The latest show by the artists of Mawaheb from Beautiful People is inspired by Dubai’s iconic buildings and beautiful blend of traditional and modern architecture. 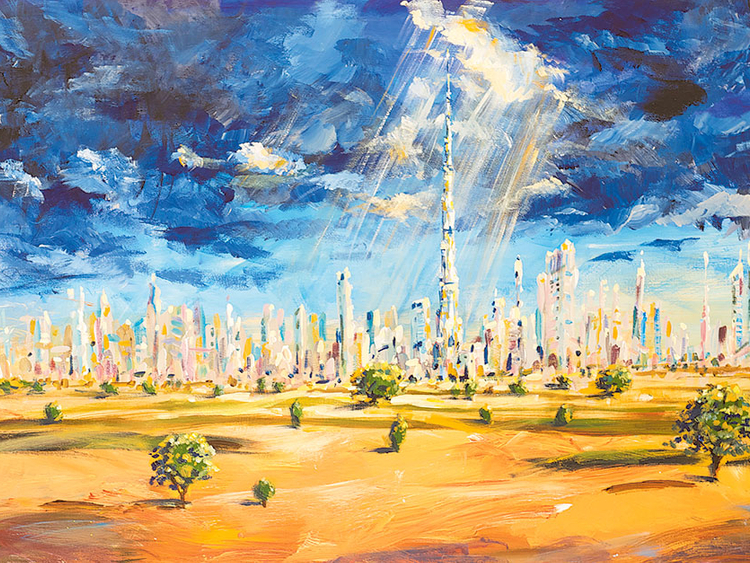 Titled “Dubai Skyline”, the exhibition features paintings, collages, mosaics, moulded clay pieces, hand-painted table lamps, ceramic bowls and clay pots, depicting different elements of the city’s distinctive skyline. Mawaheb, which is the Arabic word for “talented”, is an art studio for adults with special needs who have finished their schooling. The studio aims to take the focus away from their disabilities, by encouraging them to discover, hone and showcase their artistic talent. Mawaheb’s success can be gauged by the fact that the work of these special artists is now regularly exhibited at prestigious galleries in Dubai. Their latest exhibition reflects their evolution as artists — they are now adept at working with various media and thinking conceptually. The artworks capture the beauty of Dubai’s iconic buildings and the breathtaking views of the city. They also reflect the ethos of the city’s multicultural community and its dynamic environment. But they essentially speak about the artists’ own relationship with the city, their dreams and desires, and the world as they see it. “Our ever-curious artists wanted to take a closer look at their environment, and to explore the cityscape from a very personal perspective, as residents of Dubai. They thought deeply about what Dubai means to them, and looked afresh at the views they see every day, the vistas they have grown up with, the buildings where they live and work, and the Dubai skies they wake up to. This show is a celebration of the city and what it means to them,” says Wemmy De Maaker, founder of Mawaheb. Gulshan Kavarana, the studio’s art teacher, encourages the artists to conceptualise and plan their exhibitions. “They chose the theme, and have been working hard for many months to create individual and collaborative artworks. We are fortunate to have architect-turned-artist Michael Arnold as a volunteer. He taught us how to look at buildings from an artist’s perspective, to observe how the shadows change at different times of the day, and how to draw them. Our artists enjoyed sketching their favourite buildings, and then putting them together to create various skylines that tell different stories,” she says. The individual artworks present refreshing perspectives about the city. Leila Margian’s painting, “7 Star”, shows the Burj Al Arab filled with many different creatures. “I put pairs of animals, birds and butterflies in there because the shape of this building, which is surrounded by water, reminds me of Noah’s Ark,” she says. Alex Loveday imagined the Emirates Towers as the place where the fairytale characters, the sleeping beauty and snow white, are lying fast asleep. He has used sequins, lace, feathers and other decorations to depict the “sleeping beauties of the Emirates Towers”. “Dubai is such a magical place, so I am imagining that one day somebody will awaken them from their slumber and they will live happily ever after,” he says. And Emirati Hussain Sajwani expresses his love for his homeland and his pride in its achievements through pieces depicting various iconic structures. Sharan Budhrani has chosen to paint the simple, but cosy apartments in Karama. And Abdullah Lutfi has focused on the people of Dubai in his painting, “Just another day in Dubai”, featuring a dog, a camel, children, fitness enthusiasts, an old man with a walking stick, and a person in a wheelchair. Working on the show helped Lutfi discover his natural talent for drawing buildings. “I enjoyed creating my individual pieces and also working on the collaborative pieces. And the best thing is that I have been invited by various art organisations to conduct workshops on drawing buildings, and I even get paid for it,” he says with a smile. The large collaborative pieces include “Dazzling Dubai”, a colourful, glittering mosaic of famous Dubai buildings made from ceramic tiles, trinkets and coloured glass; an impressionistic rendering of the spectacular fireworks on New Year’s Eve; and a triptych which captures the buzz on Sheikh Zayed Road with energetic splashes of black, white and gold. There are also aerial views of Burj Al Arab and Palm Jumeirah, with pieces of glass depicting the shimmering water. And a work in clay titled “Shamal” shows what the city looks like during a sandstorm. In a huge collage, “Building the Burj Khalifa”, the artists have filled the building with photographs of construction workers. “When we were conceptualising this work, we discussed the twinkling lights of the building, and its power and majesty. We also talked about how to depict the people who live in the building and those who actually built it. But our artists strongly felt that the labourers who constructed the building should get credit for their hard work. They decided to put only photographs of the workers in the collage, and used a blue outline to reflect their blue uniforms. We are grateful to artist Elise Vazelakis for sharing the photographs she took for ‘The Gamcha Project’ with us,” Kavarana says. “The success of our earlier shows has given our artists a lot of confidence. We hope art lovers will also appreciate and enjoy this exhibition,” she adds. “Dubai Skyline” will run at Showcase Gallery, Al Quoz, until December 2.